Sharon Gentry is a member of an ongoing successful Breast Nurse Navigator program at the Novant Health Derrick L. Davis Cancer Center. She is part of a team that acts like a seamless thread in community-based care of breast cancer to connect 2 hospitals, a Breast Mammography Clinic, a Regional Cancer Center, a surgical office, and a variety of community resources in Winston-Salem, NC. She received her undergraduate bachelor of science degree in nursing at the University of North Carolina at Chapel Hill and her master’s degree in nursing education at the University of North Carolina at Greensboro. She lectures nationally on navigation and/or breast cancer care. Sharon has been a member of the Oncology Nursing Society since 1983. She was a founding member of the Piedmont Triad Oncology Nurse Chapter in 1988 and has served in a leadership role since its inception. She currently encourages national oncology certification and supports the scholarship programs as Chair of the local Oncology Nursing Foundation. She was a participant at the inception of the Oncology Nursing Certified Breast Care Nurse (CBCN) examination and actively wrote items for the team as well as co-chaired the Oncology Nursing Certification Breast Care Committee 2010-2012. 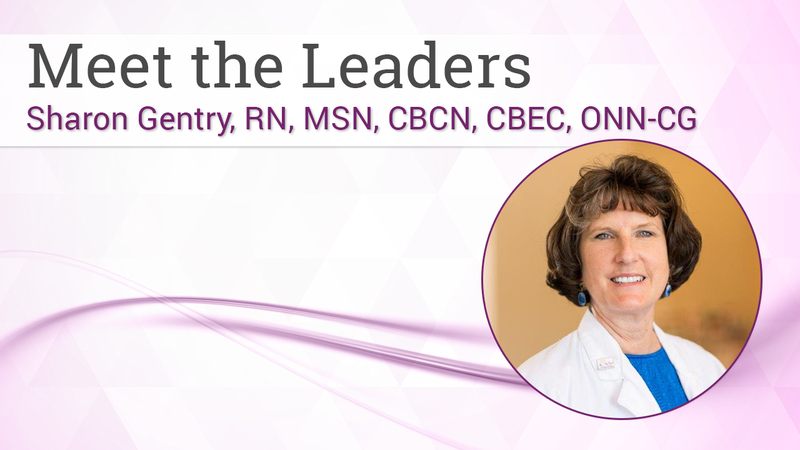 She was a team member for the creation and sustainability of the Academy of Oncology Nurse & Patient Navigators Oncology Nurse Navigator–Certified Generalist (ONN-CG) certification. She holds certification as an Advanced Oncology Certified Nurse, Certified Breast Care Nurse, and ONN-CG. When facing one of the most difficult challenges of their lives, many cancer patients and their families also have to deal with overwhelming barriers to care. Having a navigator to identify and remove those barriers can provide patients with the care they need and help to eliminate some of their burden.